She scurries off to her next table of starving tourists or locals. Amy has learned to juggle a multitude of jobs, live on the road at an early age, and develop talents when she had to, all of which honed her for living in this valley. Her path hasn’t always been easy. Her mother was only in her late teens when Amy came into the world. A few months later, Amy’s father was killed in combat in Vietnam. Her mother moved around quite a bit after that, working as an operating room technician. Amy submersed herself in books, admitting that her fervor as a quiet child and complete nerd was reading a lot of Sherlock Holmes and anything British or mysterious. The first stop of the tour was at a resort in Jackson Hole, where the Rusty Draper Band would play two shows a night, six nights a week for six weeks. “We never got home till 3 a.m.,” Amy said of the musician’s life of late nights. “When we first arrived, we’d roll in and go right to the bar inside the Wort Hotel and set up with the rest of the band. He played the room next to the Silver Dollar Bar. It smelled like cigarettes and stale beer and I loved it! I don’t drink beer to this day,” Amy laughs. There were additional tour dates to Reno and other resort towns that involved more smoky bars. Her grandmother ran a tight ship when it came to the professionalism of the band, whose members were all required to be sober or else. “My grandmother would freak out,” Amy says. Back in those days of the 1970s, Jackson Hole was not much of a resort, according to Amy, but her grandfather’s band drew a crowd and they had their groupies, who were wealthy couples that would follow the band around. “I attended all the shows and kept seeing these same people,” Amy says. Being the granddaughter of a famous recording artist, and being able to be a part of the tour, Amy would feel so much pride when her grandfather sang a song from the stage just for her. “He’d sing me the classic, ‘Once in Love with Amy.’ Grandpa was not a songwriter, he was a musician and entertainer, playing an old Gretsch guitar.” Amy beams as she shares her road stories and the history of grandpa Rusty Draper, who had multiple recordings that sold more than a million copies in the 1950s and ‘60s. When he was younger, he had worked at a radio station in Des Moines, Iowa, where he often filled in for Ronald Reagan, who was then a sportscaster. He later had his own radio shows in San Francisco and Los Angeles, Calif. and was often on television, including two appearances on The Ed Sullivan Show, and he even hosted his own TV show for a season on NBC. “My grandparents’ home was my haven,” she says. So when her mother decided to move to Texas as Amy was heading into eighth grade, it didn’t sit well. “I’m still recovering from high school.” She grimaces about the move to the Dallas area in 1982. When her mom remarried, her step dad, who worked for telephone company GTE, was transferred to Dallas. “I got thrown into this very wealthy area,” which was alien to her coming from an average middle-class neighborhood in Seattle. “I was 14 and it was a difficult adjustment.” Amy was in culture shock. “I didn’t understand who Ralph Lauren or Calvin Klein were, and at the time they were new and expensive. So I wasn’t popular. I had no connection there with anyone.” She graduated in 1986 and enrolled at North Texas State University in Denton (now the University of North Texas) taking a business curriculum. “I had a really good time, but I was not really focused on classes, so I immediately started a family with a man I had known in Denton.” They married in 1990 and the couple had two daughters, Victoria, born in 1991, and Priscilla in ‘95. 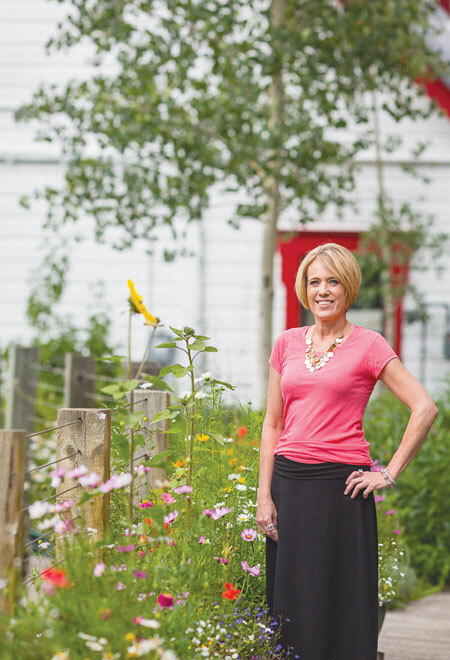 For employment, Amy took over her family’s successful dog boarding kennel in Denton after her mother moved to Gunnison in 1996, and a couple of years later Amy sold that business. She then went to work for the Denton Chamber of Commerce, running all their programs and business events. “It was a great job and I still miss it. It was during a growth time, which made it a lot of fun, connecting with all the business owners.” Probably needing more caffeine from an exceptionally busy work life and raising her girls, Amy decided to start up her own drive-through espresso shop, which became instantly popular. When Amy divorced in the late 1990s, she felt as though she had lost her focus, and moving closer to her mother in Gunnison in 2001, Amy landed a sales job at the Gunnison Country Times. She later went to work in sales for The Yellow Book. In between the various types of employment, Amy picked up seasonal winter work as a counter agent with United Airlines. Her third daughter, Jillian, was born in Gunnison in 2003 during a brief marriage. Amy excelled in customer relation skills, and Yellow Book wanted to keep her as a saleswoman, moving her to Portland, Oregon, in 2006. “Portland was a great area but didn’t speak to me, and I moved back to Gunnison in 2010,” she tells, and adds that she started working as a server at Ryce. Amy remembers what it was like to be pulled out of her element and tossed into another universe at the critical age of 14 and wanted to make sure her daughter gets to stay in Gunnison. “Jillian is going into eighth grade, and being 14 is more crucial than people realize. You need things consistent, you don’t want to make big changes in their lives.” Although Amy doesn’t ski because she swears she’d just get cold and fall over, she makes sure her daughter gets to ski.